Curious and fearsome. The Great Barracuda. A solo character floating in the shallows, shadowing divers along the reef with formidable looking teeth. I see at least one on every dive. Often they were on the menus here on Bonaire. A tasty, white fish. I thought they were safe to eat because of the pristine waters and the smaller catch size. The Caribbean waters here are not an issue for mercury poison like up North where mercury gets into the water, turns into methylmercury, which is toxic. The toxin is then absorbed by fish and stored in the muscle. 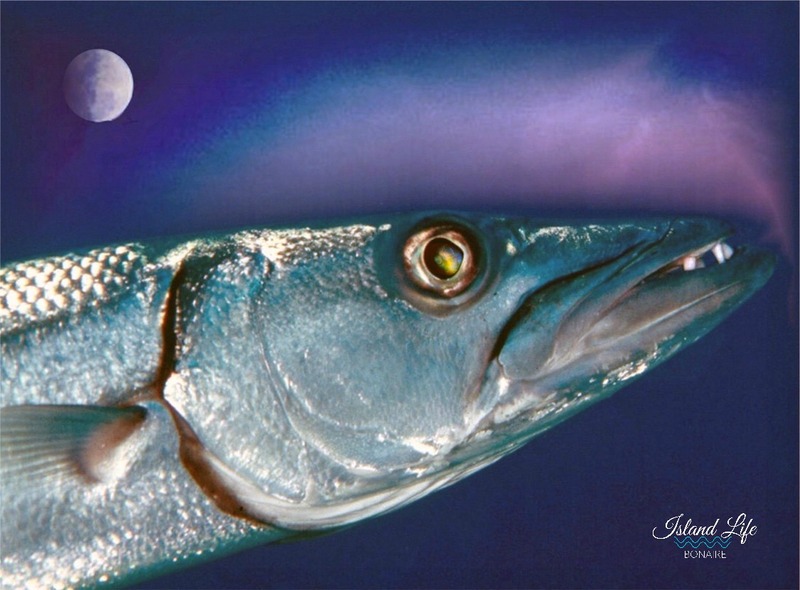 Lately, however, the Barracuda has been disregarded as a commercial fish in Coral Reef waters because of the chance of bioaccumulation of ciguatera toxin. The “Cig” threat begins when small herbivorous reef fish ingest toxin bearing plankton and algae which is their food. Larger, carnivorous fish eat the reef fish, and are in turn eaten by even larger predatory fish like Barracuda, which may in turn be eaten by us. Where present, ciguatera toxicity levels can become dangerous for humans. Although hosts to the toxins, the fish themselves are not ill. According to the Caribbean Fisheries Research and Management Project (CFRAMP), affected fish looks, smells and tastes normal. Freezing, drying, marinating, salting or cooking the fish does not destroy the poison. The freshness of the fish has no bearing on its toxicity. Ciguatera symptoms include gastrointestinal and neurological effects. There is no effective treatment or antidote for ciguatera poisoning. The mainstay of treatment is supportive care. Most people recover slowly over time. Avoid those fishes that are most often toxic. Potentially ciguatoxic fish include (but are not limited to) barracuda, greater amberjack, kingfish, cavalli, mutton and dog snapper, sharks, large grouper, hogfish and moray eel. Wahoo, dorado and tuna are rarely implicated.